Wood Panels: What, me worry?! 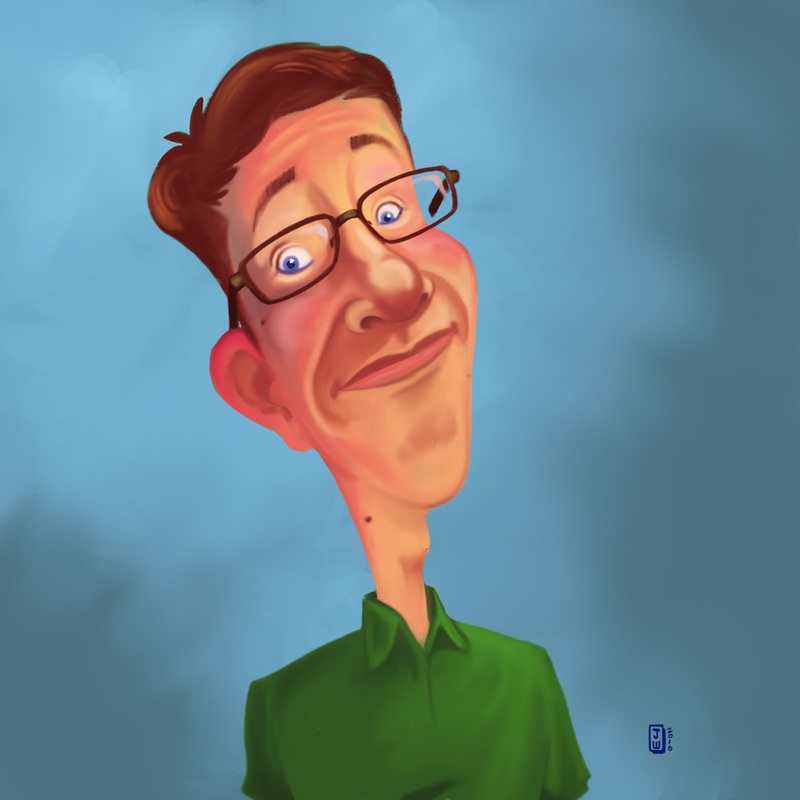 Yesterday I saw a caricature a colleague did of himself. I've been working on learning some Photoshop techniques, so I thought, "that looks like fun, I'll do one of myself". Ok, this is my second attempt at doing digital painting in a serious (ahem... concerted) way, and before you pop my balloon, Mr. Ghost, I think it turned out pretty gerflichin' well! Ok, so the colour is a bit saturated (about the glowing ears... mine glow! ), and the area between the lower lip and chin crease needs a bit of work. It might be funnier if the nose were more red, and perhaps the hair needs to have more depth. But I like it. I think the proportions have been pushed in a funny while retaining a likeness (no, if you don't know what I look like, I'm not going to put a photo of me up for comparison!). I did it mostly with a brush that had shape dynamics texture that made it look a bit like a pastel and then used the mixer brush a whole lot to blend the tones as you might do with an oil painting. Love that technique. The thing that cracks me up though, is how much this looks (to me) like it could have been in Mad Magazine. I feel like I caught the style. I haven't looked at a Mad Magazine in ages, but somehow that style is in my head. I think that's pretty cool and interesting. That looks funny and it looks like you -- mission accomplished! It also does look like it belongs in a MAD magazine. Actually, it looks like it belongs on the cover. That's the style they use on their Alfred E. Neuman covers. Took another look at this yesterday. It's OK... good for a beginner but it lacks depth around the mouth and lower nose - too much brown, not enough shading. Also, the colours are too hot - they're almost iridescent next to the background. I kinda like that the colours are so hot. They make you stand out and that palette makes your style different. I think you're just being a big crybaby. *SNIF*... I just... I just... "WAAA"! I think you are a very nice, *SNIF* kind and intelligent person who has discerning tastes and considered opinions that I greatly respect. Just wanted to moderate my glowing remarks about the thing a bit so that you (my colossal readership) wouldn't feel a disconnect between the quality of the piece (it's pretty good) and my comments about it ("Look at this AMMMAAAAAZING thing I did"). Or maybe I'm doing the thing of talking it down first so nobody else will. I wonder if I should start a confessional blog that is part therapy, part exercise diary. It turned out well, so well that you surprised and pleased yourself -- what's wrong with that? Nuttin'! Live it up! You know what? Maybe you're just a big doofus. Yeah, that's right, you heard me -- doofus! You know, I can block you. How would you like that?! You don't have the guts to block me! I'm unblockable!